In order for us to provide you with the best possible support, we do ask that you contact us using the email address registered on your PokerStars account, if known. This enables us to review your account history, check for any problems relating to your account, and ensures that only you are able to request personal and private information. If you do not know which email address is registered to your account, you can go to ‘Account’ -> ‘Change Account’ -> ‘Change Email Address...’ in the PokerStars lobby, where your email address will be displayed. If the email address listed on your PokerStars account is obsolete or incorrect, we recommend changing it. This can be done using the ‘Change Email Address...’ option as seen above (after changing it, please see Email Validation). As always, support@pokerstars.se is there to help! Both Real Money and Play Money players need to enter their User ID. 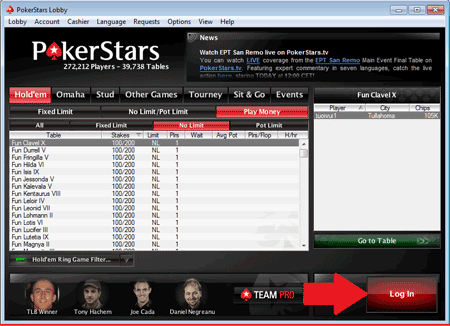 If you have never played for Real Money on PokerStars, simply enter your email address in the field indicated by the red arrow. 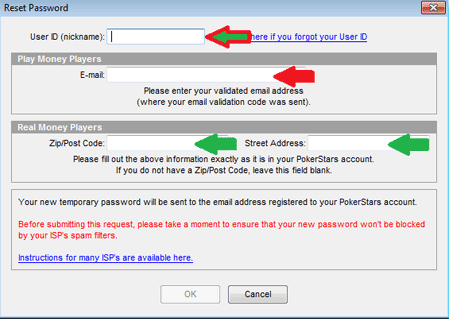 If you have at any time played for Real Money on PokerStars, you must enter your Zip/Post Code and Street Address in the fields marked by the green arrows, but you do not need to enter your email address. Click OK. IMPORTANT NOTE: If you do not see the ‘Real Money Players’ fields marked with green arrows, visit the Missing Features section prior to attempting a password reset. An email with your password will arrive within a few minutes. If it does not, please click here for instructions, as our email likely ended up in your spam/junk mail folder. I forgot my User ID. Can I open a new account? 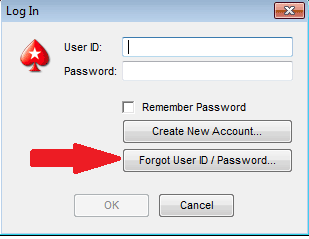 What do I do if I have forgotten my User ID? Enter into the 'Email' field the email address which you believe is registered to your PokerStars account, then click ‘OK’ (OK will become available after you enter your email address). Tip: If you have multiple email addresses, try all of them! An email with your User ID will arrive within a few minutes. If it does not, please click here for instructions, as your email likely ended up in your spam/junk mail folder. If you did NOT receive the above message, but instead received the message below, please ensure you entered your email address correctly. Please also attempt to use other email addresses you may have used to register your PokerStars account. This approval process takes five days. If, after five days, your image still is not visible, please contact support@pokerstars.se, and we will look into it for you. I have had my image for a long time, and now I want to change it. But, the option to change it is greyed out! The intention of images at PokerStars is that they will identify you to the other players at the table. If we allow for constant changes, it will detract from that idea. That said, we want you to enjoy your time here at PokerStars, and if it has been a long time since you uploaded your image, then feel free to contact us at support@pokerstars.se. We will then see what we can do to help! It would also be helpful if you send us the PokerStars program log files from your computer, as these will help our Technical Specialists to determine the nature of your connection problems. The files are: PokerStars.log.0, PokerStarsUpdate.log.0, PokerStarsCommunicate.log.0 (if present). Please see below if you are unsure how to find or send Log Files. If your connection is only poor for PokerStars or has been a long-term reoccurring connection issue it is possible it is revealing a connection stability issue that will not manifest itself on most other Internet sites and applications. We are willing to assist you in trying to isolate and resolve this issue and will require some information about your system and connection. First you may wish to learn more about disconnections and the common causes found on the Download FAQs page. It says I need to validate my email address. What is this all about? How do I validate my email address?? 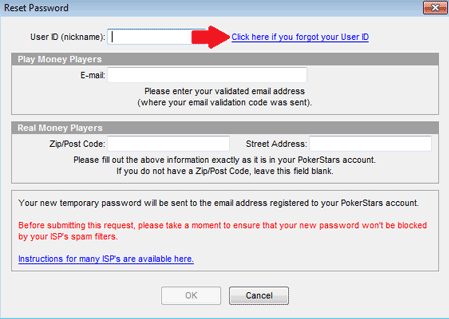 As an important security feature, all PokerStars accounts needs to be associated with a validated email address. Should you ever need to recover your User ID and/or your password it is important we know beyond doubt that it is the actual account owner who is attempting to access the account. Likewise, should you need information or support specific to your account; we need to know we are communicating with you, not someone pretending to be you. 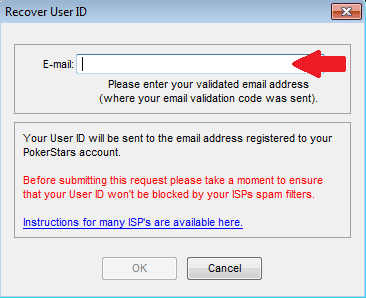 You need to validate your email address, as this is where all important communication from PokerStars will be sent. To ensure that your email address was typed in correctly, and that we have a safe way of communicating with you, a validation code is sent to your email both when you initially register your account, as well as every time you change the email address on your account. Now: How do you validate your email address? After registering your account or changing your email address, an email was sent to you, with an email validation code. You will need to find and open this email, in your email inbox. If you did not receive this code, verify that the email address you entered is correct by going to ‘Account’ -> ‘Change Account’ -> Change Email Address…’ as shown in the below image. If your email address is correct, and you did not receive the email containing your validation code, please visit this link. 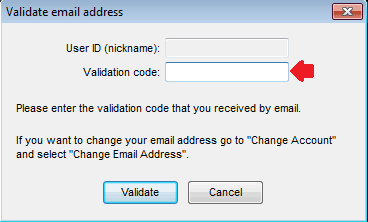 Once you have located the email with the validation code, proceed to Step 2. You will now be prompted to log in to your account, unless you have already done so. To log in, simply enter your User ID and password. A message should appear confirming that your email address has been validated. This will activate your account and you can then proceed to play the games at PokerStars. If you get an error message stating the code is incorrect, please verify that you entered the validation code correctly, and that you are not attempting to use an old validation code (only the most recent will work, if you have multiple). Congratulations – you have now validated your email address, and you are ready to enjoy all of PokerStars games! Don’t forget, you can contact support@pokerstars.se if you get stuck at any point. Once your "total" play money chip balance goes below 100, you can get more chips up to three times per hour. The "total" is any amount you have at the tables plus anything remaining in your account. The refill option is only available in play money ring games, which are located in the 'Hold'em', 'Omaha', 'Stud' and 'Other Games' sections of the software. It is not possible to refill play money chips in tournaments. To get more play money chips, visit any play money ring game as described above. This must be a game with an open seat and with a buy-in lower than 1,000 chips (not a high-stakes table). Click on any 'Seat Open' icon, and your account will be automatically refilled to 1,000 chips. At this point, you may choose the amount you wish to bring to the table or you may then leave the table to play in other events such as play money tournaments. If you are already seated in a play money ring game, you can get more chips by clicking on the chip tray at the top of the table, and then clicking on 'Add More Chips', or by simply right-clicking on your own seat, which will bring up the rebuy menu. For visual instructions on reloading your play chips, please visit this link. How many Play Money Sit & Go tournaments can I play at the same time? How about Ring Games? Similarly, there is also a limit of a maximum of five ring game tables at the same time. Real money ring games are available at limits starting from $0.01/$0.02 and real money tournaments are available with buy-ins as low as $0.02, so even a small deposit of $10 can have you playing for a long time. If you do decide to deposit, remember to enter the first deposit bonus code "STARS600" which allows you to earn a 100% deposit bonus up to $600. For more information about this promotion, and terms and conditions, please visit the PokerStars Deposit Bonus page. 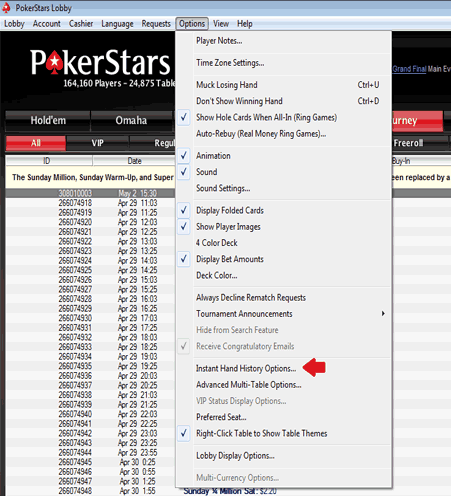 PokerStars has just the feature you are looking for! All tournaments you are registered in will then be displayed. Just select one and you will be taken to the Tournament Lobby. Absolutely! Simply go to ‘Requests’ -> ‘Find a Tournament’, and input the Tournament Number. The Tournament Lobby will then pop-up on your screen. You can also press the hotkeys Ctrl and T at the same time, to access the feature faster. For detailed information on why this is so, please visit this link. Should you have further questions regarding our shuffle or security of our software, feel free to ask any question you would like in an email to support@pokerstars.se. The integrity of our games is paramount to our success, and we are happy to address any concern you may have. Also take note of the option to ‘Change Folder…’, which will let you choose a custom location for your hand histories, along with the ‘Open Folder’ button which lets you instantly open the folder where you are currently saving your hand histories. Using this prompt, you can also choose the language in which your histories are written, and for how long they are to be stored on your computer. You may wish to consider activating our 'Instant Hand History' feature, should you wish to immediately review your hands. 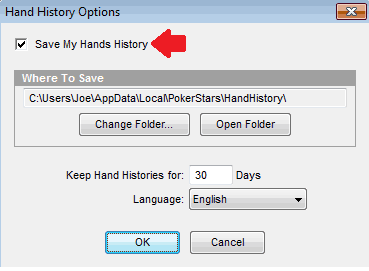 Using this feature you will be able to see a hand history from within the PokerStars software. A window will pop up and the hand histories will be there. Please note that if you close the software the hand histories will not be stored unless you have specified otherwise. To learn how to save your Hand Histories, see the How do I save my Hand Histories? section above. If you cannot see any chat – including your own – you have turned off chat. To turn it back on, click the chip tray or 'Options' button on the table (this will cause an 'Options' window to pop-up) and place a check mark in the 'Show player messages' box. If the chat of observers is blocked, to unblock it, click the chip tray on the table and place a check mark in the 'Show observer messages' box. In order to resolve this, you will need further information from PokerStars Support. Please contact support@pokerstars.se, from the registered email address on your account, with a description of the problem. PokerStars has a team of Chat Moderators whose job is to review chat complaints at the tables. You can reach a Chat Moderator by clicking the chip tray or ‘Options’ button at the top of your table, clicking the ‘Call Moderator’ button, then entering a description of the problem. A Chat Moderator will come to your assistance. Do take the time to review our Online Poker Chat FAQ first, however. If the ‘Call Moderator’ button is not available, please email chat@pokerstars.se with the details of your complaint. First, please review our Card Room Rules and our Poker Games FAQ , and make sure that you actually did nothing wrong. Keep in mind that retaliatory chat is not permitted, and may cause your chat to be suspended. If you are certain your chat should not have been suspended, contact chat@pokerstars.se with a detailed explanation of the issue. I am missing a feature I previously used/need to use – how do I get the full-feature version of your software? 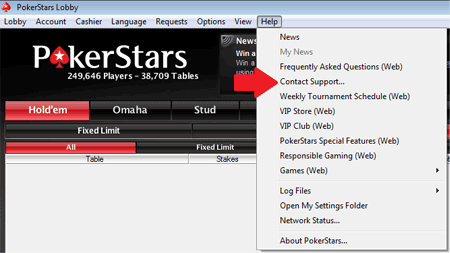 If you are missing the above features, this indicates that you are using PokerStars.NET. This is a special "play money only" version of our software. The full-featured version of our software is available on PokerStars.eu. To download the .EU version of our software, please go to our download page. If you are using a Mac, go to our Mac download page instead. Once you have downloaded and installed that program, you may continue to login using the same User ID and password you have been using on PokerStars.NET (in fact, you need to use the same User ID and password as on PokerStars.NET). In the full version of our software, you can find all of our play money games, as well as a variety of great features, including a 'Cashier' button to track your chip total, the popular 'Find A Player' feature, the ability to upload Images to display at the table, an 'Instant Hand History' feature to track the hands you have played during your current session, freeroll tournaments where you can win real money prizes, real money games, and much more. Please note that although we do have real money games, you are under no obligation to play them, and there is no charge of any sort involved if you wish to play solely for play money. PokerStars prides itself on taking player feedback seriously, and if you have any improvement suggestions or ideas, please email our Poker Room Management Team directly via ideas@pokerstars.se. Should you require a response for any part of your query, please send your email to support@pokerstars.se, as we will then both address your concerns, and notify our Poker Room Management of your suggestion.